Designed and built as Battersea's Town Hall. Home to Battersea Arts Centre since 1984. Striking features include historic mosaic floors, marble staircase, stained glass dome and refurbished Grand Hall with contemporary lattice ceiling. The first thing to notice, before you even enter the building are the very detailed carvings above the front door. The semi-circular carving, at the very top, is of the Battersea coat of arms being supported by 'Prudence' and 'Justice'. Underneath this are the figures of 'Authority' on your left and 'Relaxation' on your right. Described as 'Modern Renaissance', this building was designed by Edward Mountford, who along with eleven other architects anonymously submitted plans for the Battersea Municipal Building and Town Hall to the Vestry of the Parish of St Mary. He won. Among other buildings designed by Edward Mountford are Battersea Library, also on Lavender Hill, and the Old Bailey. Building began in 1892. The staircase you can see is made from white Sicilian marble. On the big red marble cornerstones you can see the names of the dignitaries involved with the building. These were hand carved just before the opening to ensure that no-one had died between the carving of the stones and the opening of the building. In 1993, it was estimated that the staircase alone would cost £1m to build now. Also, in the foundations of the staircase there is a time capsule containing local newspapers from the day of the opening. One of the most interesting aspects of BAC is the changing use of its spaces. When the building first opened this space was the Medical Officer’s office and the adjoining room was the Sanitary Inspector's Office. There was also a waiting room for people wishing to see either of these important people. Later it became a cinema, and then was used as Studio 2 showing new and developing work by performance artists and musicians. Now it holds artists’ bedrooms. In 2011, a call went out for 6 artists to design and create a room which would house their performance in the second One on One festival in 2011. The only two criteria were that they had to act as a working bedroom that could be comfortably stayed in after the performance and they had to be themed on an existing story. 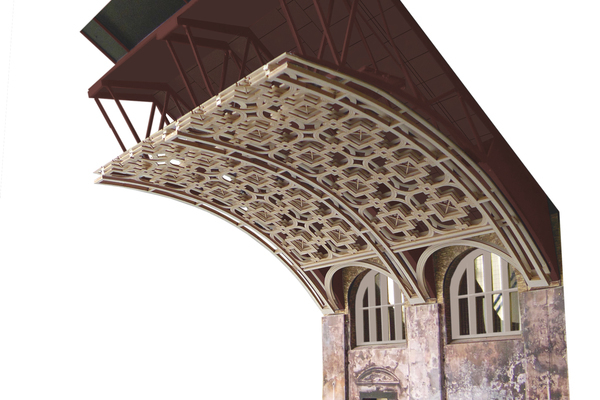 The chosen designs went on to provide Battersea Arts Centre with the legacy of permanent residency spaces, allowing future artists to live and work in the building without limits, providing complete creative freedom without impinging on the public opening times. Having a community of different artists in residency generates dialogue and cross-pollination of ideas. This idea of Battersea Arts Centre providing a ‘Home’ for artists has gone on to become a crucial aspect of the final masterplan, and has been developed further, having three floors of bedrooms designed by three different artists, and including a communal kitchen. During the time of this being a functioning Town Hall this space was used as the Council Chamber where local councillors met to debate and govern the borough. Note the 'Ayes' and Noes' signs above the doors to the theatre. The choice of councillors' door would have indicated his or her vote. 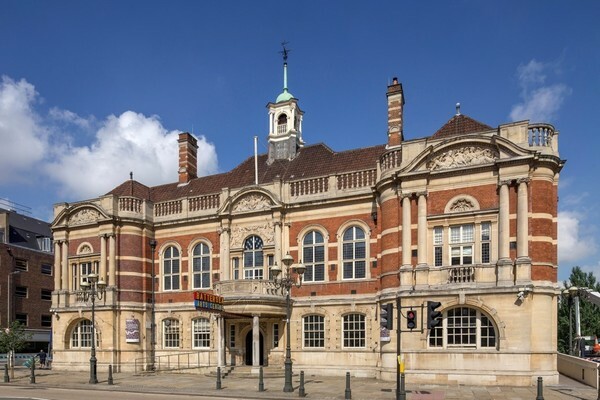 The Council Chamber has always been one of Battersea Arts Centre’s main performance spaces. Until February 2011 it was a black box space, with a permanent seating rake. In March 2011 Kneehigh returned to Battersea Arts Centre with their award winning show The Red Shoes which had originally been staged in the Council Chamber. We used that opportunity to return the space to its original form, the idea being that artists should be able to use and respond to it, almost casting it as a character in their productions. The black paint was stripped; the permanent rake was taken out and replaced with a flexible system which could be used throughout the building. The result for The Red Shoes was a completely new and flexible approach to staging. It also allowed for the space to be used for commercial purposes and now the Council Chamber is regularly hired for functions and events. From upstairs in the main building you can see that the most obvious feature of the building is the mosaic floor. This is made from glass mosaic tiles. Quite why bees are the main feature is nor certain, however there are several ideas. One is that in the middle ages the bee, like the ant, was a sign of industriousness, so it could be that the borough wanted to portray itself as being hard working, OR Lavender Hill was once a market garden area so it may have been to remember the area used to be full of bees OR it could just be a play on the Bs in Battersea Borough. Interestingly, the same bee design can be seen on the floor of Manchester Town Hall, lending credence to the socialist, worker ethic. The Grand Hall reopened in March 2010 after a two-month restoration and refurbishment programme overseen by Haworth Tompkins. This was the first phase of a two phase project which included a new floor, decorations, curtains, lighting and power. Sadly the Grand Hall was then virtually destroyed by a devastating fire on 13th March 2015 which left only the walls standing. Under the direction of Haworth Tompkins the external envelope and roof of the hall have been rebuilt, whilst internally those elements of the Grand Hall that survived the fire have been preserved and features of the fabric that were lost in the fire have been reinterpreted, such as a new timber lattice ceiling that reflects the original decorative plaster ceiling. The rebuilt Grand Hall opened on 13 July 2018. "If you look up, you will see an elaborate stained glass octagonal dome. This covers the entrance hall to the Grand Hall. Around the walls of the lobby are the words "The purest treasure mortal times afford is spotless reputation; That away men are but gilded or painted clay" and "Mine honour is my life both grow in one", a little architectural joke as they are illuminated in gold leaf. Also of interest, the marble pillars you can see are not marble. They are made of ostrich feathers which were treated, swirled and dyed, and set in plaster-like material to give a marble effect. In 1893 this would have been cheaper than using real stone. Now this is only made in South Morocco and would be much more expensive than marble. “As with the rest of the building, the Grand Hall has had several functions. During the First World War it was used as a recruiting station, administrative centre and conscientious objectors' tribunal site. It was a Council of Action headquarters during the General Strike in 1926. In the Second World War it had many functions, as a site of rationing control, distribution of gas masks, an Air Raid precautions centre and as a hospital. During the worst of the bombing, whilst the Grand Hall was used as a hospital, the Lower Hall (downstairs) was used as a morgue. “In the 1950s the Grand Hall took over from the (bombed) Shakespeare Theatre – now Shakespeare House in Theatre Street – as a place for music hall, theatre and live entertainment. “In 1993, the building's centenary year, BAC took over the running of the Grand and Lower Halls. Nowadays they are mostly used for weddings, conferences, holding examinations and performances." Staff formerly employed by Battersea Borough Council were invited back to join in the centenary celebrations in November 1993 and some took part in an oral history project directed by Jo Stanley, which can be consulted in the archive at Wandsworth Heritage Service, located at Battersea Library. The interviews can be listened to via the BAC website.